Genevieve White, age 89, a resident of Calumet passed away peacefully at Houghton County Medical Care Facility on April 12, 2018 with her family by her side. A Memorial service will be held on May 19 at 12:00 at the Calumet United Methodist Church with Pastor Jayme Palaszeski to officiate. Friends may call at the Calumet United Methodist Church from 10:00 until time of service. She was born on May 12, 1928 to John and Lucille Rowe in Calumet, Michigan. She graduated from Calumet High School. She retired from the Calumet Public Hospital where she worked for 35 years as a nurse’s aide. She enjoyed working in the nursery, and she was there when some of her grandchildren were born. She enjoyed her crafts, knitting, crocheting, plastic canvas, and counted cross stitch. She also took a class in ceramics and made many items like a Christmas Village, lamps, and many small items. She painted a count by number painting of the Last Supper. She was on a womens softball team and they won the league championship. She bowled on a league for many years and also took up golf, golfing on the morning and evening leagues. She married Weldon on December 11, 1949 at the Calumet United Methodist Church and together they had seven children. 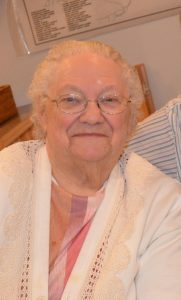 She was a life-long member of the Calumet United Methodist Church. She was preceded in death by her husband Weldon, her parents, an infant daughter Janine, a son Daniel, her brothers McGee, Donald, Garfield, Jack and her sisters June Webb, Althea Heikkinen, Sharon Strieter and a son-in-law William Darnell Sr.
She is survived by 3 sons: Jim (Gloria) White of Niagara, Wisconsin, Albert White of Calumet, and David (Lori) White of Calumet, 2 daughters: Jacqueline Darnell of Calumet, and Susie (Al “Chipper”) Utzman of Tennessee, 14 grandchildren, 22 great grandchildren, and numerous nieces, nephews, cousins and friends. A Memorial service will be held on May 19 at 12:00 at the Calumet United Methodist Church with Pastor Jayme Palaszeski to officiate. Friends may call at the Calumet United Methodist Church from 10:00 until time of service with a luncheon to follow. Burial will be at the Lake View Cemetery in Calumet.